Denim Jacket For Men: Men’s closet will be incomplete if they don’t have a denim jacket! In this guide, you will get to know different ideas of how to wear denim jackets on a different occasion; so, that your look is the most stylish and comfortable! Denim Jacket is something that can be worn for 12 months around the clock with great versatility. Whether you wish to dress up in the 70s – 80s trend of styling in baggy denim or follow the trend of the millennium to wear a double denim; denim jackets have become an essential – integral part of men’s wardrobe. Usually, it seems an easy option to wear a denim jacket but in order to look smart, you need to work it out. Hence, if you are looking for a roadmap for how to wear a denim jacket, read our complete handbook. Reasons to wear a denim jacket. Wear it for all seasons: The biggest reason for wearing a denim jacket is that it’s suitable for most of the year. The denim jacket is warm enough to get through the winter season yet it is light weight to make look classy during spring. The only time you would avoid will be during the heights of summers. However, the weight of denim jacket varies – you have thin jackets available as well that can work for all three seasons. Tougher & Durable: Denim jackets are known for their toughness. It is something that you can beat yet it would same old jacket like our decade old jeans! It requires less maintenance comparatively to other delicate clothes. Looking for proofs? Why don’t you twist it, pull, stretch your denim jacket and check it yourself that it is NOT going to get ripped easily, even a wrinkle won’t be there for you to notice? Moreover, if you buying a brand like Levi’s then the lifespan of it will longer than a non-brand denim jacket! Heavier the volume tougher and durable it will than a simple jacket made from the weave. Decade after Decade: In last few decades, denim jackets have grown to be one of the classic outfits yet it is also one of a casual outfit as well. 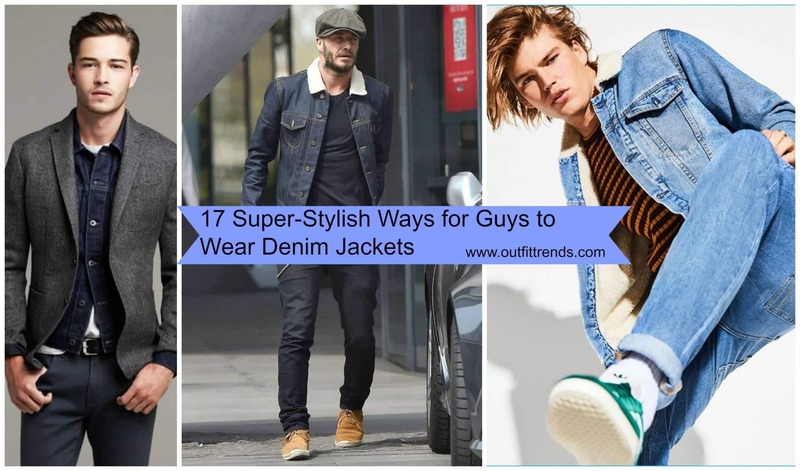 The denim jacket is a great substitute for a blazer or a bomber jacket or a sports jacket either of these proves to be tight and stiff in comparison to a denim jacket. To make classier, you can grab a t-shirt with a collar that would enlighten your face feature a notch up. Furthermore, if you are looking something as fitted as sports jacket, then denim jacket is available in all variety from slim-fitting to lose fit! #17- Cargo Pants with Denim Jacket. Denim Jacket in black is all time versatile piece for all ages! Team up your denim jacket with khaki pants and cowboy hat! To give it up a casual yet stylish look. #14- Denim Jacket with a Hoodie. For extreme cold weather, you wish to look casual yet warm enough to walk across the city, then team up one of your hoodies with ruffled light shade denim and look flawless and warm! #13- A Douche Denim Jacket. Looking for something different? Why not wear a douche wrinkled denim jacket! Be it a denim blue jacket with pockets or white stripes on a blue denim jacket; all will look surely look trendy enough to grab a lot of attention if you team up with denim jeans and add a khaki blazer or a waistcoat like shown in the picture! #11- Long Denim Jacket and Beret Hat. Time to trend yourself up in 80s street style. Go and look into your closet for long denim jackets and one of your beret hats to complete your look for the day! #10- Jordon Barrett in Blue Denim Jacket. Get an inspiration of wearing a look of the same color of denim jacket and jeans by Jordon Barrett. A ready to wear look for Sunday or a beach look where you are planning to hang out with friends! Looking a funky look? Grab a denim jacket that has print patterns all over it. #8- Triple Layers Denim Jacket. Looks like Triple later of Denim is back in trend! Team up your denim jacket with jeans and denim shirt with a pastel color yellow shirt, so that your shirt and jacket don’t get mixed up! #7- Turtle Neck Top with Denim Jacket.